BOYCE — Tiny stream critters, looking like extras in a miniature horror flick, have a tale to tell. To the educated eye, they can give clues to the health and cleanliness of flowing streams and rivers. Gem Bingol of the Piedmont Environmental Council invited half a dozen Clarke County residents to become detectives panning for those clues in Spout Run, during a meeting Wednesday at the Boyce Volunteer Fire Company social hall. Bingol is setting up teams to begin a monitoring program as part of the effort to clean up Spout Run, which has been declared an impaired waterway by the state. A number of groups and organizations have joined forces to clean up the stream. Bingol said the new monitoring program, which will survey aquatic organisms at specific sites four times a year, will be used in conjunction with the chemical monitoring of water samples from 12 sites in Clarke. Aquatic organisms can provide a snapshot of the health of a stream, Bingol said, because some species can only live in clean water, while others have adapted to various levels of pollution. 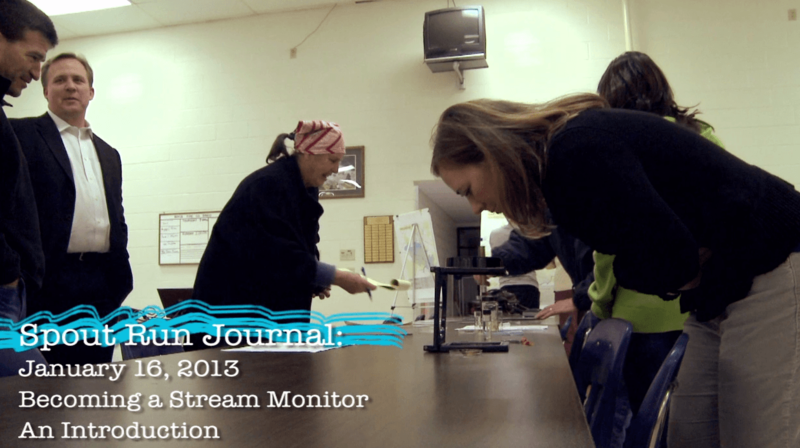 “They can tell a story about the water quality and the ecological health of the stream overall,” she said. Monitors use a net to capture organisms at a particular spot on a stream, usually downstream from a riffle, a spot where water gains oxygen by tumbling over rocks. The volunteers follow a specific procedure, developed by the Virginia Save our Streams organization. They capture organisms, sort them — usually into ice cube trays — and then identify them. The number of each type is noted on a form and experts can interpret the str eam’s health through the data. Bingol said the Virginia Department of Environmental Quality does the same type of biological monitoring at 150 locations across the state, but that means lots of places aren’t monitored. That’s where citizens can take action, she said. With new volunteers, the PEC will help set up monitoring posts at locations on Spout Run, which could help show progress as other groups work on projects like stream bank restoration and tree planting. It usually takes monitors about two hours to check a site, she said, adding that they want to quickly return the critters to their habitat. A team leader will have two or three volunteers helping with the critter survey. Bingol will lead a training session for the new volunteers on Feb. 12. Families are welcome to attend, she said. Dean Bradley, who lives on the Shenandoah River, said he has four children who might be intrigued by the activity, while earning community service hours demanded by Clarke County schools. Terrell Juth, who lives on the Blue Ridge Mountain, said she and her husband enjoy fishing in the Shenandoah, which was why they decided to attend the meeting. She said they will probably join a monitoring team. Citizen science, she said, “is a good way to get people to care” about the environment. For more information on the monitoring program, contact Bingol at 703-431-6941 or email her at gbingol@pecva.org . For information on the Spout Run cleanup project go to spoutrun.org . 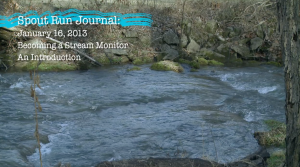 Captured on August 26, 2012, our journal segment features Seth Coffman, Shenandoah Headwaters Home Rivers Initiative Coordinator for Trout Unlimited, and Steve Reeser, Fisheries Biologist for the Virginia Dept. of Game and Inland Fisheries, conducting a fish count along Spout Run below Carter Hall. Seth is managing targeted streambank restoration for the 2013-2014 National Fish and Wildlife Foundation grant. He arranged for Steve’s assistance in acquiring some baseline fish population estimates to help measure success.